King Vidor directed Marion Davies twice in 1928: first in The Patsy, released in April, and then in Show People, released the following November. 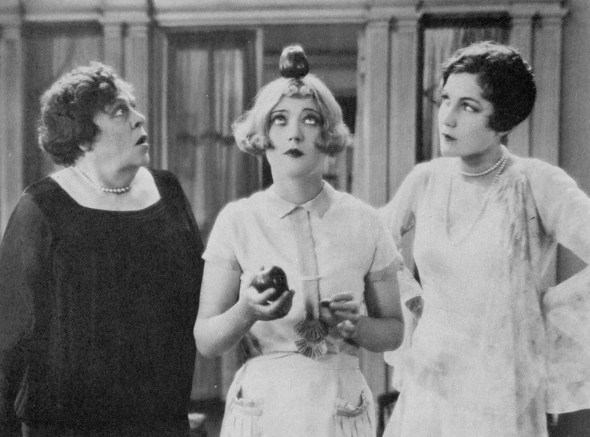 Show People was a career highlight for the actress—a funny, weird, intelligent comedy, one of the best of the silent era. The Patsy, also a comedy, falls far short of it. It’s not that The Patsy isn’t funny, or that it isn’t weird. It is frequently both. It just isn’t very smart. I watched The Patsy with a dozen or so friends of mine, most of them fans of silent film. It got a fair number of laughs from us, and that qualifies as a recommendation for any comedy, I suppose. But the movie, overall, left me cold. Anyone can fill 70 minutes with gags and get a few chuckles, especially when they’ve got actors as naturally, almost genetically, funny as Davies, and her top-billed co-star, Marie Dressler. These were gifted comedic performers, with great range; and an all-important willingness to look foolish. They will crack you up, no matter what. But they can’t make The Patsy a good movie, just a bad movie filled with good gags. Davies plays the (eponymous?) ‘Patsy,’ Patricia Harrington: younger daughter of an upper-middle-class family led by her father (Dell Henderson) in principle, and her mother (Dressler) in practice. The mother, a formidable, thin-skinned woman, openly favours Patsy’s sister, Grace (Jane Winton). Patsy’s only other major stress is Tony Anderson (Orville Caldwell): the young man whom Grace indifferently dates, and Patsy secretly loves. This is the setup of The Patsy, not that it matters much. Nothing, really, matters much in this film, beyond the performances of its two stars. The real purpose of The Patsy’s plot is not to deliver Patsy into Tony’s arms, or even to deliver Ma her comeuppance, though both of these things do seem crushingly inevitable from the opening minutes. It is simply to let Davies perform the routines for which she had, undeniably, a great talent. There’s a lot of what in this movie, but very little why. But why do these things happen? The groaners come about because Tony earlier suggested to Patsy that she develop more ‘personality’ (something she certainly does not lack, at least in the modern sense of the term—perhaps the terminology has changed? ), and Patsy responds by reading every self-improvement book she can find. Hence, the aphorisms. This didn’t strike me as a logical response, even from a teenager. But it does give Davies a chance to deliver those lines. The hat scene is one of several manic Davies routines borne of an offhand remark by her doting Pa: “Let ma keep on thinking you’re a bit cuckoo and you can do anything you want to.” What poor parental advice that is, even in a farce; and especially in this farce, where Patsy’s strange behavior is likely to result in a smackdown for both herself and her dad, courtesy of Ma. The mimicry’s an attempt by Patsy to impress a man. The reasons why she does this are too involved (and too much of a spoiler) to explain here, but be assured that they, too, are a logic-leap removed from the sketch that results from them. Stuff like this bugs me. 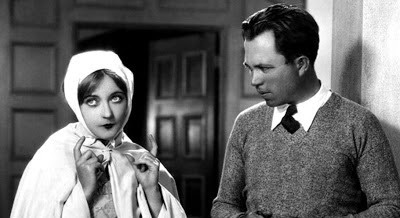 Vidor, who, through Show People, The Crowd (1928) and other silent films, displayed his gift for keeping out of an actor’s way, here takes it too far—it’s as though the entire film steps aside to let the performer do her work. And Davies, I think, had the talent to give us a more nuanced Patsy than the one we got. Yes this kid’s got problems, but instead of trying to solve them, she just becomes Marion Davies. The Patsy is part of the Warner Archive Collection, available for order from the WBShop.com. Special thanks to Caren Feldman, of the Toronto Film Society, for screening this film. How strange...I just watched The Patsy this morning and then stumbled across your article. I've been a fan of this movie for years and it never fails to cheer me up. It is probably the order in which I saw them but I always preferred this one over Show People, although I agree that Show People is probably the better film. Nice article. I'm always pleased to see that I'm not the only person who knows The Patsy exists. Thanks. Feedback here, on Facebook, and on Twitter suggests you're not alone in your feelings. The film doesn't work for me, but it clearly has its charms.